Ms. Khan is the founder of an India-based non-profit technology that employs design thinking (an interdisciplinary school of design at Stanford University) to connect women who have faced violence with legal, economic and medical assistance. This platform was incubated in a California not-for-profit formed to collaborate with similar organizations in India and Stanford’s Sensa Accelerator, and nominated for the Ashoka Changemakers and UNESCO competitions. Ms. Khan also recruited a core team to design and build the first domain. The first pilot was launched in India with certain other countries to follow. Ms. Khan won a Stanford Haas Fellowship to work at a leading Hague institution that undertakes legal research and innovation in international law. Ms. Khan researched, managed and wrote the Women’s Report for the first comprehensive survey of Yemen’s justice needs. During this period, Ms. Khan also developed a law and economics framework for analysis of surveys and questionnaires and was instrumental in the development of an online divorce platform. 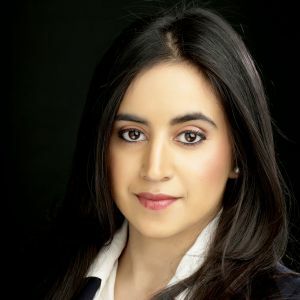 Ms. Khan has worked at a barrister’s chambers in the UK and in Oman and has gained experience in a variety of litigation and corporate matters involving public and private sector parties. Ms. Khan also advised Stanford Law School’s Afghan Interpreter Project. Keynote Speaker at the ‘Code for India’ Summer Convocation, Bangalore, India – August 2014: Ms. Khan addressed the positive role of technology in social empowerment and recruited volunteers for Zariya technology development. Keynote Speaker at a European Commission event, Brussels, Belgium – May 2014: Ms. Khan spoke to a group of ‘Blue book Stagiaire’ trainees (those who have passed all EC selection stages) in Brussels about the importance of the social enterprise model in policy-making and access to justice, and conducted a short workshop on how to develop a social enterprise idea. Participant and Speaker at Stanford Bing Overseas “Islam in Europe” conference, Cordoba, Spain – November 2012: As a member of the Oxford team, Ms. Khan presented legal solutions for the successful and effective integration of Muslim minorities in various European countries with a special emphasis on the UK, Spain, France, Germany and Italy.